Meanwhile, the area under opium cultivation skyrocketed by more than 60 percent to 328,000 hectares (1,266 square miles), up from 127,000 hectares (490 square miles) last year. The cultivation area is nearly 20 times the size of Washington, DC. 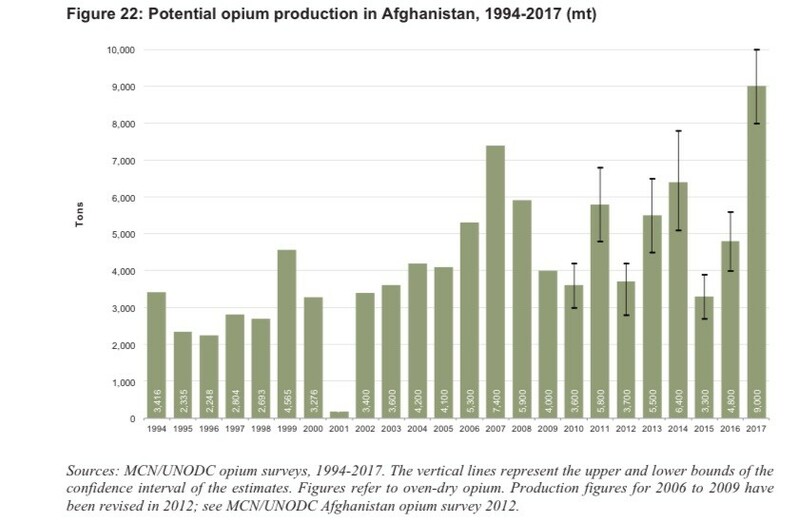 Afghanistan is currently producing nearly 50 times more opium than in 2001, when the United States invaded the country in an ongoing effort to defeat the Taliban and its al-Qaeda allies. U.N. officials estimate that the war-ravaged country only produced 185 metric tons of opium in 2001 when the Taliban reportedly instituted a ban. 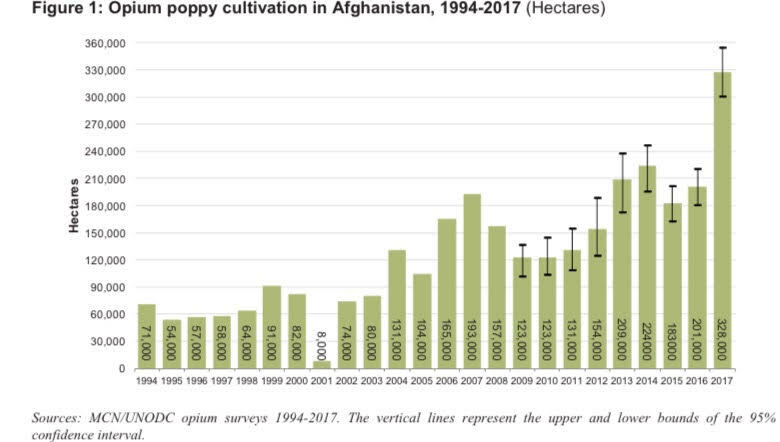 Despite the United States having devoted an estimated $8.6 billion to counter-narcotics efforts in Afghanistan since the war started in October 2001, poppy cultivation continues to rise and the country remains the world’s top producer of opium and heroin. The total area under opium poppy cultivation in Afghanistan was estimated at 328,000 hectares in 2017, a 63% increase or 127,000 hectares more compared to the previous year. This level of opium poppy cultivation is a new record high and exceeds the formerly highest value recorded in 2014 (224,000 hectares) by 104,000 hectares or 46%. Potential opium production was estimated at 9,000 tons in 2017, an increase of 87% from its 2016 level (4,800 tons). 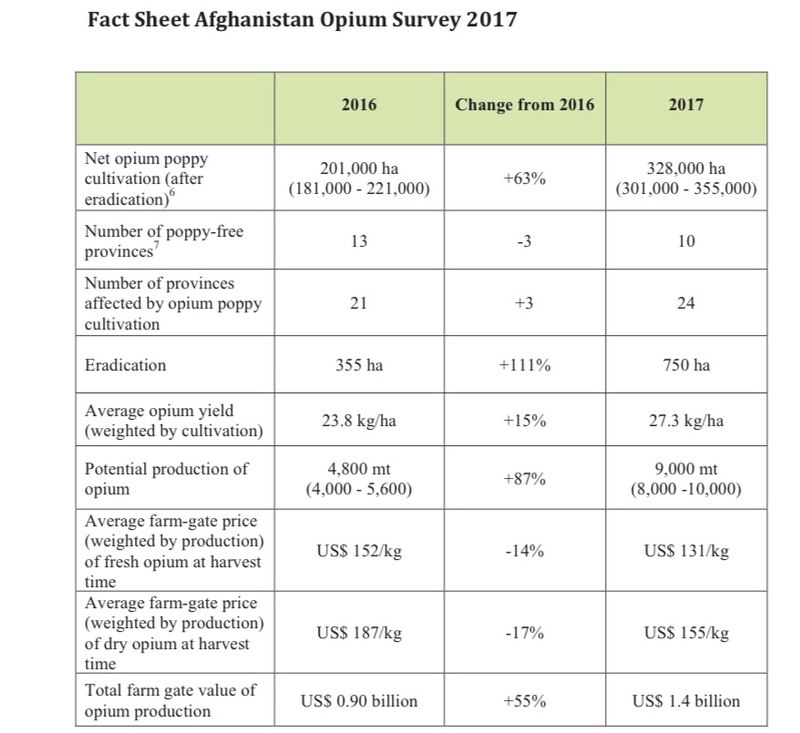 The increase in production is mainly a result of an increase in area under opium poppy cultivation, while an increase in opium yield per hectare also contributed. The U.N. identifies corruption, rule-of-law-related challenges, political instability, low levels of employment, and lack of government control and security as the “main drivers of illicit cultivation.” The report warns, however, that “there is no single reason” for it. According to the U.S. military, the Taliban generates 60 percent of its estimated $400 million in annual revenue from trafficking opium and heroin. The historic level of opium cultivation suggests the terrorist group will likely yield more funds from the illicit trade this year. “Amounting to US $[1.39 billion] … the estimated farm-gate value of opium production in 2017 increased by 58% from its 2016 level. 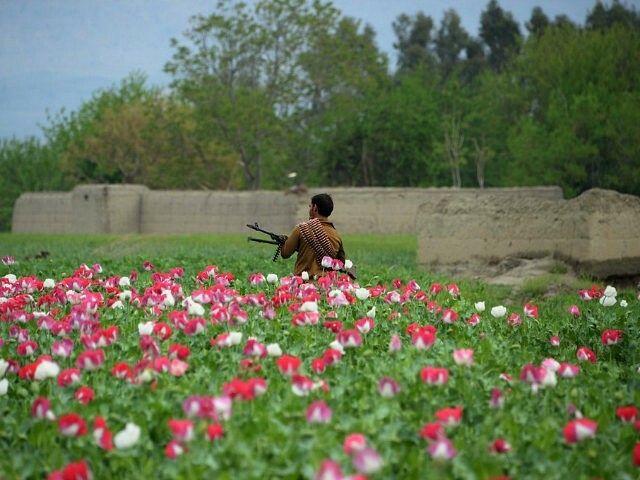 The increase in farm-gate value was mainly due to the 87% increase in opium production,” reports the U.N.
Helmand, a Taliban stronghold along the Pakistan border in southern Afghanistan, remains the country’s “major opium poppy cultivating province,” accounting “for about half of the total national increase,” notes the U.N.
Taliban terrorists control most of Helmand (also spelled Hilmand), which sits next to Kandahar, the birthplace of the jihadist group. Southern Afghanistan’s Helmand and Kandahar are the deadliest provinces for the U.S.-led coalition and Afghan forces. Most (60 percent) of the cultivation is concentrated in southern Afghanistan along the Pakistan border. “Hilmand remained the country’s major opium poppy cultivating province, followed by Kandahar, Badghis, Faryab, Uruzgan, Nangarhar, Farah, Balkh, Nimroz, and Badakhshan,” notes the U.N.
Nangarhar is home to the leading Islamic State (ISIS/ISIL) stronghold in the Afghanistan region. Opium production appears to be contributing to the significant increase in the Taliban’s strength, allowing the group to buy more weapons and ammunition. Opium cultivation and territory under the Taliban’s control has increased side-by-side. The terrorist group currently holds more land than during any other time since the United States removed its regime in late 2001. Terrorist groups, primarily the Taliban, control or contest about 45 percent of Afghanistan, reports the U.S. Special Inspector General for Afghanistan Reconstruction (SIGAR). In a dramatic turn of events, poppy eradication more than doubled this year after the efforts nearly disappeared under former U.S. President Barack Obama’s watch. “A total of 750 hectares of verified poppy eradication was carried out by the provincial Governors in 2017. This represented an increase of 111% from 2016 when 355 hectares of Governor-led eradication (GLE) was verified by [Afghan Ministry of Counter-Narcotics/U.N. ],” notes the U.N.
Last month, U.S. Secretary of Defense James Mattis said President Donald Trump’s South Asia strategy would focus on fighting the lucrative opium trade to deny the Taliban funding. Speaking as a private citizen, John Sopko, the chief of SIGAR, urged the U.S. government to probe the potential relationship between record production of opium in Afghanistan and the historic number of opioid-linked deaths in the United States. As production in Afghanistan has skyrocketed, drug overdose deaths have reached record levels in America. The DEA argues that only a small portion of Afghanistan heroin makes it into the United States. However, American Gen. John Nicholson, the top commander of U.S. and NATO troops in Afghanistan, does not dispute that Afghan opium is contributing to the drug overdose fatalities in the United States. “I don’t want to make Afghanistan safe for shipping heroin to the United States,” he added.